It’s October, when my mind turns to Halloween fun. 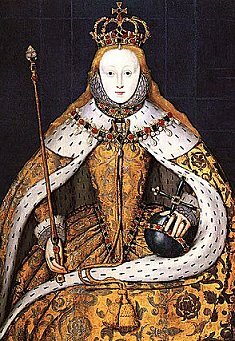 I’m hard at work on this year’s Halloween costumes (Medusa and Queen Elizabeth I in her Coronation dress and crown), but I’m also thinking creatively about fun food and spirited decorations. One way to make breakfast fun with Halloween spirit is to make Bat Bagels. Just place a bagel on a cutting board and slice in half to make two semi-circles. (I’m using Noah’s Chocolate Chip Bagels here.) Then, starting at one tip, slice the bagel across to the other tip and then spread open. This creates the bat shape. These work well with mini bagels to create Halloween party food. Let kids add their own toppings and spreads to create a bat sandwich. Or you can even add a mini hot dog to the middle for a bat body, maybe adding cloves or pimentos for eyes. Alternately, make a bat head cookie cutter and cut pieces out of American cheese slices. To make your own cookie cutters, buy some thin tin sheet at a hardware store such as OSH, snip a 1″ wide strip with old scissors, bend into the shape you want and hold the ends in place with a binder clip. Use pencils, flatware, spice jars, etc. to bend around to create the shapes and points needed. If you enjoy this fun holiday and want to add some Halloween spirit at work, how about a Beaded Bat Lanyard. We custom make these name badge lanyards in both silver and gold, plus you have your choice of sixteen colors. Another popular choice is the cool Bat Money Clip. If you’d like to see our other Playful Bat Gifts and Decor such as money clips, Halloween ornaments, flasks and pill holders, please click the link and check us out. BTW, the Bat is a symbol of Happiness and Longevity in Chinese culture, so this amazing animal can be a positive way to express yourself all year long. I should have the photos of the Medusa costume (olive green silk shantung with appliquéd snake and snake jewelry, although I did purchase the snake headdress from Bonnie’s Treasures) and Queen Elizabeth I Halloween costume (golden orange flower-patterned jacquard, and yes, I’m making her crown, too) up on the site by the 25th, so check back then if you’d like to see the results. This weekend marks the 34th annual Half Moon Bay (CA) Art and Pumpkin Festival. This year, the recording breaking pumpkin weighed in at 1524 pounds, beating the Fair’s previous record by nearly 300 pounds! These big pumpkins are on display today and tomorrow at the festival. They will also have the winners of the Most Beautiful pumpkin contest and the top locally grown pumpkin. So just how big are this year’s crop of Champion Giant Pumpkins? It appears that farmers are getting better every year at growing the largest pumpkins. This year’s 1524 pound Pumpkin Festival winner was grown by Thad Star of Oregon who received $9,144 in prize money for his efforts. (Maybe he could use one of my Pumpkin Business Card Holders.) The record size of a squash in a California contest was a pumpkin that weighed 1535 pounds, and was set just this week by Pete Glasier of Napa, California. The world record size of a pumpkin is 1,689 pounds and was grown this year by Joe Jutras of Rhode Island. Apparently, pumpkins in this class can gain as much as 10 pounds a day. The fair runs from 9:00 a.m. to 5:00 p.m. Saturday and Sunday and admission is free. Other fun events at the fair will include more contests: pumpkin carving, pie-eating and Halloween costume contests. Plus, there will be the Great Pumpkin Parade, a display of the giant weigh-off champion pumpkins, a haunted house, home-style foods, harvest-inspired arts and crafts, and three stages of blockbuster entertainment. Something for everyone in the family. It looks like they will have great weather, too. It has been raining the last two days, but today has dawned clear and bright. Just as a warning, I used to do this fair back in the 1990’s, and what I remember most is being cold. VERY cold. It is held in downtown Half Moon Bay which is right on the coast, with a blanket of fog covering it quite often. Also, traffic can be a problem, with the long, two-way road into Half Moon Bay being very slow, so don’t plan on getting in or out of the area quickly. If you’d like to see more of my pumpkin themed gifts such as the Pumpkin Pill Carrier or Travel Case or the Pumpkin Business Card Holder, please visit my website page: Unique Pumpkin Gifts. Also check out my Autumn Leaves Decor and my Rainy Day Gifts. This month marks the 25th Anniversary of Kyle Design and this also happens to be my 100th blog post. What a reason to celebrate! Set off the fireworks! Twenty five years of designing gifts, jewelry, scarves, home decor – and I feel fortunate to have made it this far. I started my business while a senior at U.C. Berkeley – majoring in business, by the way – but what I really wanted to do was be an artist, be creative and design my heart out. So, has my business evolved over the years? Yes!! From painting silk to designing in metal, from working crafts fairs to blogging – what an evolution! I started out painting silk scarves and wall pieces using a modified batik process I learned from Ina Kozel, a nationally recognized fiber artist here in the United States. I took what I learned from her and ran with it, figuring out a way to do what I was told couldn’t be done. I had a tiny studio in Berkeley then, and could only paint three scarves or one wall piece at a time. I had to wait a day for them to dry before I could start another batch. I was desperately needing to increase my output and realized I needed to make smaller items: Jewelry, earrings, bracelets. Still using silk, mind you, still working with color. Color has been a continual theme in my work over the years. Being creative and getting bored with the same old shapes for earrings, I came up with the idea of combining the silk with etched metal frames in unusual shapes. From there it was on to all kinds of mixed metal jewelry in unusual shapes. I created unique pieces which used combinations of etched metals, niobium and anodized aluminum and were embellished with glass beads, wire and turned parts. A body of work that ranged from brightly colored, very contemporary to pieces with more subdued colors and an ethnic feel. That was just the first eleven years! Before I had kids! (I’ll save the next 14 years for another post.) My work continues to change and evolve, but I think I retain elements from all past work in my current collections. It was quite one thing to start my business and choose not to interview for a “real job” about a year later as I was approaching graduation. (My friends at the business school were quite aghast that I was NOT interviewing, as they all were!) It was quite another to actually be ready to support myself from my art, and those early days really were a struggle. But I can proudly say that, aside from babysitting in junior high and working for my parents (also artists) throughout high school and college, I have never worked for anyone else. Determined, I was. This 25th Anniversary just happens to coincide with my 100th blog post. Blogging is new for me, obviously, but even 100 blog posts feels like a milestone. I never considered myself a writer and I still agonize over every word more than I should, but I have to admit I’ve come to enjoy it. Guess I’m more opinionated than I might have thought. Or at least I realize how much I have learned over the years. In the beginning, blogging felt like something I had to do, but now I appreciate having a forum where I can introduce my new work but be chattier or less formal in how I present it. I feel like I have to stick to the facts on my website Kyle Design, but on my blog I can loosen up, add personal details, elaborate on the inspiration behind designs, talk about my family, or even what life is like for an woman artist in general. I’m not just crafty in my work, but in my personal life as well. Where else would I share my creative party ideas, favorite recipes or my elaborate Halloween costumes? It’s all good…. To see my more recent work which includes light switch plates, engraved business card holders, flasks and holiday ornaments among many other unique items, please visit Kyle Design. The Movie “Waitress” – Sweet Film Makes You Want to Bake – So I Did! Two pies in the oven, waiting for them to finish baking. So what inspired me? I recently saw the film “Waitress” and loved it. It’s the story of a small town waitress married to an overly-controlling husband who finally finds the strength and means to escape from the relationship. She loves baking pies, is renowned for her skills and comes up with clever and insightful names for the pies. Choice examples are “I Hate My Husband Pie” which is made of bananas and bittersweet chocolate (“and don’t sweeten it”), or “Baby Screaming It s Head Off in the Middle of the Night and Ruining My Life Pie” which is a New York style cheesecake with brandy-brushed pecans and nutmeg. Berry season is winding down to an end here in the San Francisco Bay Area, so I picked up a flat of berries – raspberries, blackberries and strawberries – and baked two pies this afternoon. I’m going to a family reunion and it has been a tradition to bring homemade pies. When I make my pies, I think of my Aunt Carol who passed away in April of this year. She made the best pies – I especially liked her loganberry pies – and I will always associate them with her. Mix together and let sit for 15 minutes, then pour into pie crust. (Use a metal pie pan for the flakiest crusts. I make my crust from scratch as well and use the recipe from “The Best Recipe” book – abridged below.) Dot with 2 T. of butter, cover with top crust, crimp, sprinkle with a little sugar, cut in a few air vents and bake at 400 degrees for about 45 minutes or until golden. It’s smelling really good in here right now…. By the way, King Arthur’s Clear Gel was ranked the best pie thickener in Cook’s Illustrated’s “The Best Recipe” book. I love this book and use the recipes all the time. Mix 2-1/2 cups flour, 1 t. salt and 2 T. sugar in a food processor. Cut up 12 T. chilled, unsalted butter and pulse about 5 times. Add 8 T. chilled shortening (I used the new trans fat-free butter-flavored Crisco) and pulse about 4 times until mixture is like coarse cornmeal and butter pieces are no bigger than peas. Turn into bowl and add 6-8 T. of chilled water. Mix with the back of a spatula and then wrap in plastic. Chill for at least 30 minutes before rolling out. If you’d like to see other unique gifts like the Chocolate Desserts Night Light, the Baby’s First Christmas Ornament or the City Lights Compact, visit Chocolate Desserts Themed Gift Ideas, Unique Baby Gifts for New Parents or Stylish Engraved Compact Mirrors. 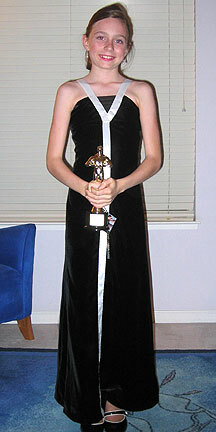 I took my girls to see the 2005 King Tut exhibit at the Los Angeles County Museum of Art, so for Halloween that year my youngest daughter wanted an Egyptian Costume. Egyptian Jewelry: Being a jeweler, I was able to make her a gorgeous reproduction of a necklace from King Tut’s tomb (mine shown at right) along with matching earrings and a scarab bracelet. I tried to make it look as close to the original as I could, so I decorated the etched gold pieces with real carnelian gemstones. 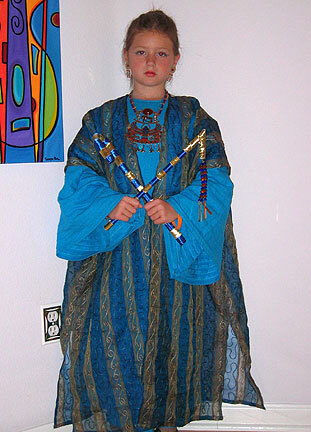 In addition I used anodized aluminum circles; gold-filled spacer beads; turquoise, coral and lapis lazuli tube beads. I used Colores epoxy resins that I bought from Rio Grande Jewelry Supplies to fill in the recesses in a cloisonné process. 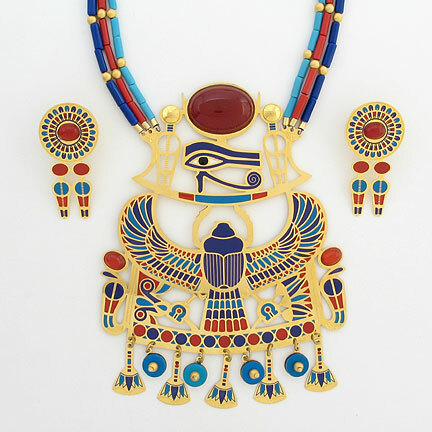 DIY Egyptian Jewelry: Want to make your own Egyptian costume but don’t want to spend that kind of time or money? I have some less expensive options and suggestions on my website here: Egyptian Costume with Gold Jewelry. King Tut Crook and Flail: No King Tut costume would be complete without a Crook and Flail. To create mine, I used Plexiglas rods and forms. 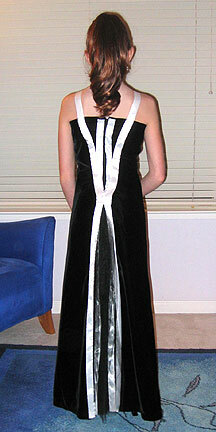 (Click the Egyptian Costume link above for more instructions.) I wrapped each with blue satin ribbon and then 1″ metallic gold ribbon at 1″ intervals. I screwed in a tiny eye hook into the top end of the flail so I could attach pressed glass pyramid beads and golden dangles. 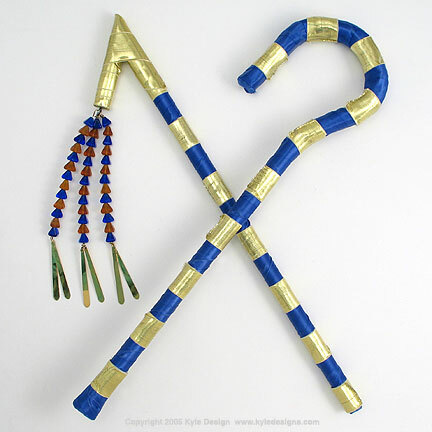 If you prefer to just buy one, I sell them on my site: Egyptian Costume Crook and Flail Accessories. To see larger photos of any of the above images, click on King Tut Egyptian Costumes. If you are interested in seeing more Egyptian themed items, such as the golden Egyptian Earrings at left or the Egyptian Eye of Ra Christmas Ornament at right, please click on the photos or visit Egyptian Gifts and Home Decor.